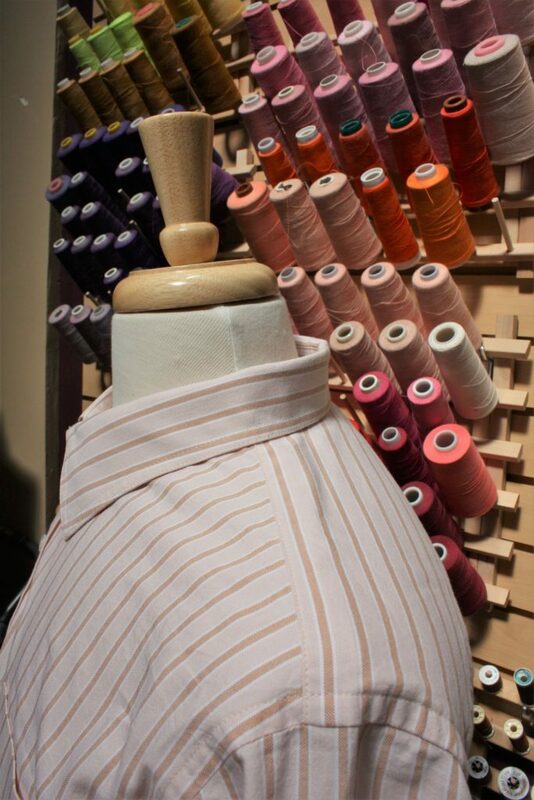 The fabric is a peachy orange striped oxford, which met with the client’s approval. The fabric is from stash, and originally came from a shirting bundle offered by Michael’s Fabrics. The stripes on this fabric run from selvage to selvage, so to get them to hang vertically on the finished shirt I cut the pattern pieces on the crossgrain. I’ve done this on prior shirt projects, without adverse results. 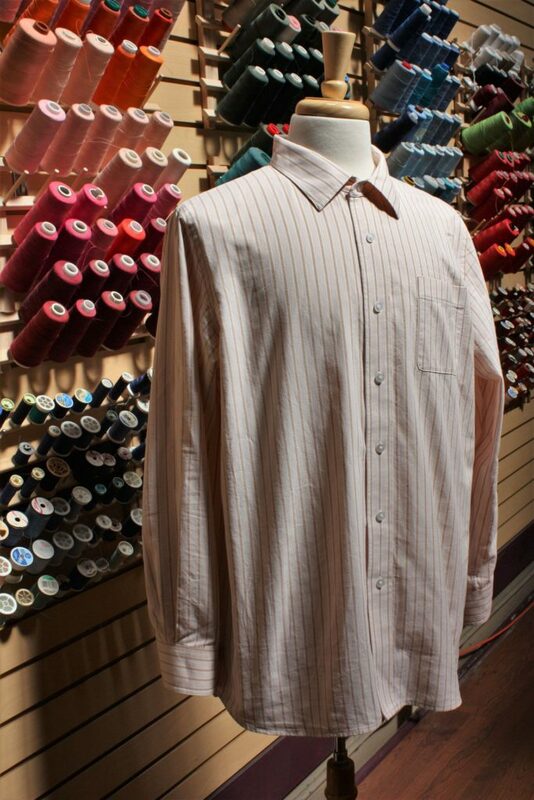 It is necessary to pre-shrink the fabric well, since woven fabrics typically shrink more on the lengthwise grain. In this case, that affects the girth of the shirt which is a bigger impact on fit. For this project, I chose Light-Crisp fusible interfacing from Fashion Sewing Supply. 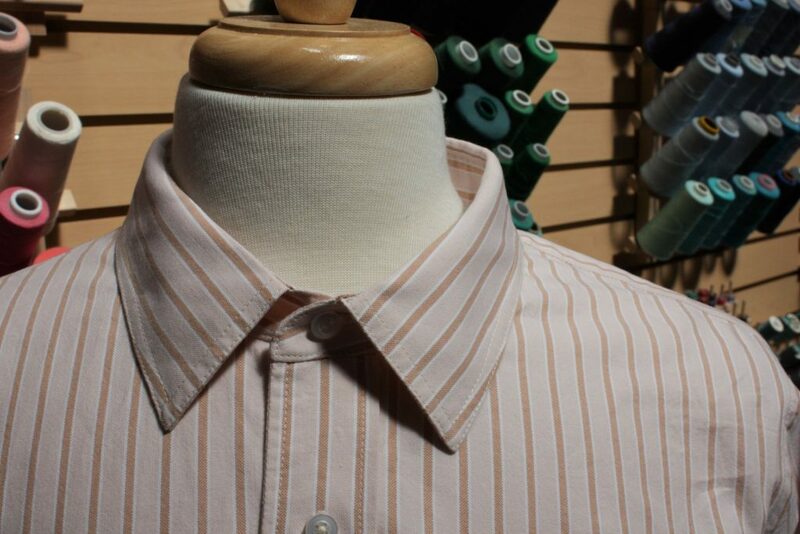 The client wanted a softer feel for the collar and cuffs. I’m not a fan of fusibles because of their tendency to bubble and destroy projects, but I reluctantly use them. And in the case of Fashion Sewing Supply’s interfacings I’ve had trouble getting them to adhere properly. But I have recently acquired a gravity-feed iron, which cranks out a great deal of heat and steady steam for applying interfacing well. And, I re-read the instructions: this particular interfacing wants you to press a second time to adhere properly. On this shirt, the facing didn’t have problems with adhesion. It’s had one trip through the laundry so far with no signs of bubbling. The collar and stand were traced from a Land’s End shirt. I went through several collar styles during fitting, but opted for a tried and true classic design. The point of this shirt is more to validate the pattern than to make a design statement. This shirt may be pedestrian, but I didn’t want it to be completely ho-hum. So for a design element I included a British-style split yoke on the shirt. The angle of the yoke places the stripes parallel to the shoulder seam. I carried the split yoke onto the inside yoke facing as well. The front pocket is self-drafted, with rounded corners. Rounded corners are the most difficult to execute nicely – in retrospect, this one has a few glitches. I machine-crimped the round corners, and pressed with a pressing template, but still got a few angled bits in the finished product. I suspect a narrower seam allowance – 1/4 inch rather than the 3/8 inch I used – would help the turn of cloth better, as would more practice – I don’t do these rounded pockets often. The front band came out well in terms of matching stripes to the front of the shirt. But it did end up a little heavier than I wanted, even with the lighter weight interfacing. One issue I have come across with interfacing involves turn of cloth. I typically cut my interfacing pieces without seam allowance, because I would like to minimize bulk. But when I cut the interfacing exactly the size of the pattern piece I’m interfacing, it gets in the way when seam allowances are turned and pressed. 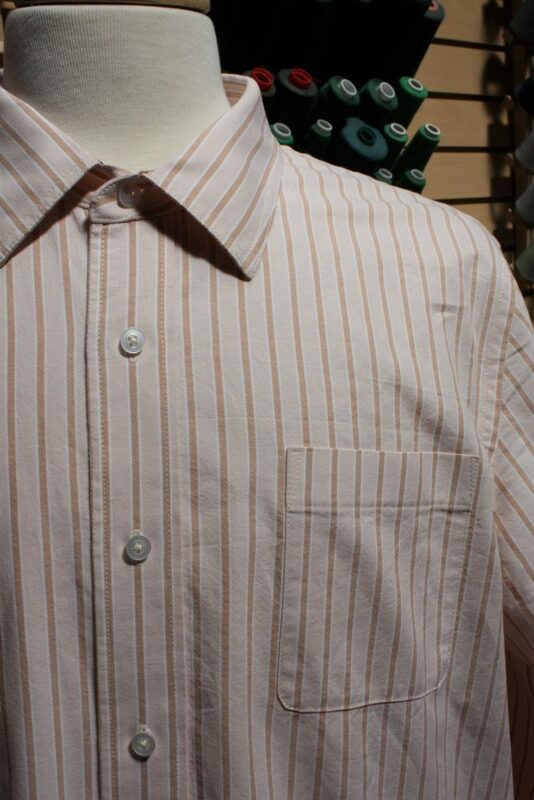 In the above front pocket photo, between second and third buttons you can see the front band has bits where the seam stitching shows on the outer edge. Normally you press that seam to favor the front, putting the seamline a millimeter or so on the inside of the garment, out of sight. But the fabric wants to fold exactly at the edge of the interfacing, nowhere else. I’m considering addressing this problem by making the interfacing pieces ever-so-smaller than the pattern piece they cover, by about 1/8 inch in each dimension. 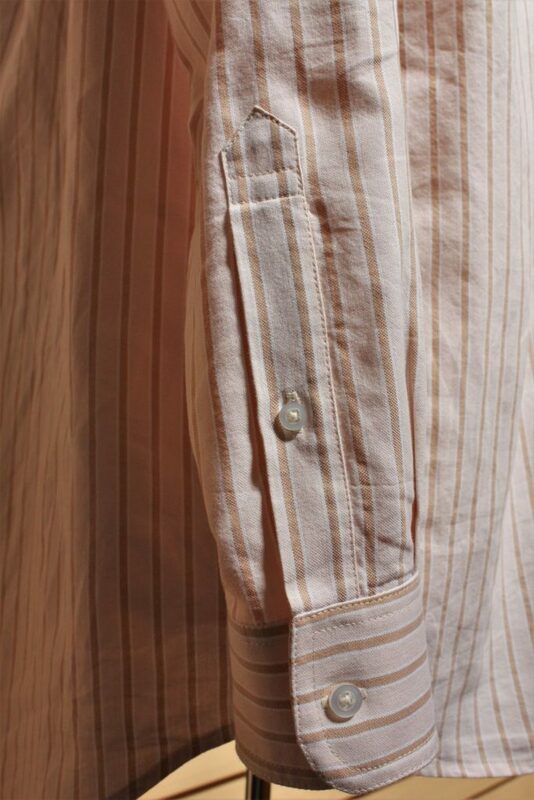 The shirt has fairly standard cuffs and plackets. The cuffs have rounded ends to echo the style of the front pocket. I drafted the placket pattern is drafted with a matching line to get the stripes on the placket to match with the sleeve, following instructions from David Page Coffin’s Shirtmaking Workbook. But mine ended up a bit off. I suspect this has to do with turn-of-cloth issues while constructing the placket, and not an error I made on the pattern. I need to double check. I used general purpose thread, and a standard stitch length of 2.5. For shirtmaking I often choose a general purpose thread over something lighter weight because it offers a better color match. I thought both choices would be okay given the casual nature of this shirt and the fabric, but I think the shirt might look nicer with finer thread and a shorter stitch length. This is a minor point, and it might also simply be a personal preference as to whether more noticeable stitching is a good thing. Overall, aside from the nits I’ve discussed here, I’m happy with the way this project turned out. Hopefully I will start part 1 of the fitting series for this shirt. I always cut the interfacing ever so much smaller, specifically for the reason you stated. And matching plackets both vertically and horizontally is a pain. Figuring it out exactly how get them to line up always takes me forever. Yeah, you think I would have figured out the interfacing thing by now. This isn’t the first time I’ve noticed it. David Coffin gives the method for figuring out where the placket pattern should align with the sleeve. 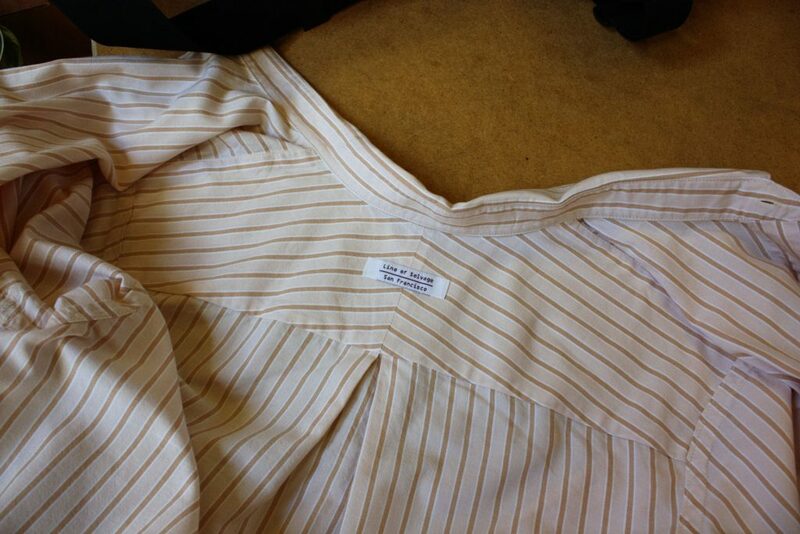 But you also have to make sure you are precise with the width of all the folds to get the placket to align. When I have some time, I plan to make a few samples and see how it works out. The shirt is worthy to be borrowed, and worn rumpled on your fit frame. The fact that we didn’t see it “modeled” by your buff, beefy, beau, needs no expounding upon via the soliloquy of the disappointed (though there’s no guarantee future comments won’t return to this topic – not that I’m petty, or any such thing.). Know this: your fitting series is anticipated from the gent in the front row (with his ankles crossed). One more thing…is this shirt being photographed at a store, or are you a spool fool? 1) I haven’t tried wearing the shirt myself – it certainly isn’t too small on me. The neckline is somewhat large for me, but who needs to button the collar? 2) My partner has appeared on the blog before, but generally he doesn’t like to be photographed or have his photos published online, so the dress form plays understudy. 3) I took the photographs at Sips N Sews (http://sipsnsews.com/), a membership sewing studio where I do a good deal of work. A monthly fee gets me access to all of their equipment, including domestic and industrial sewing machines, embroidery, sergers, coverstitch. 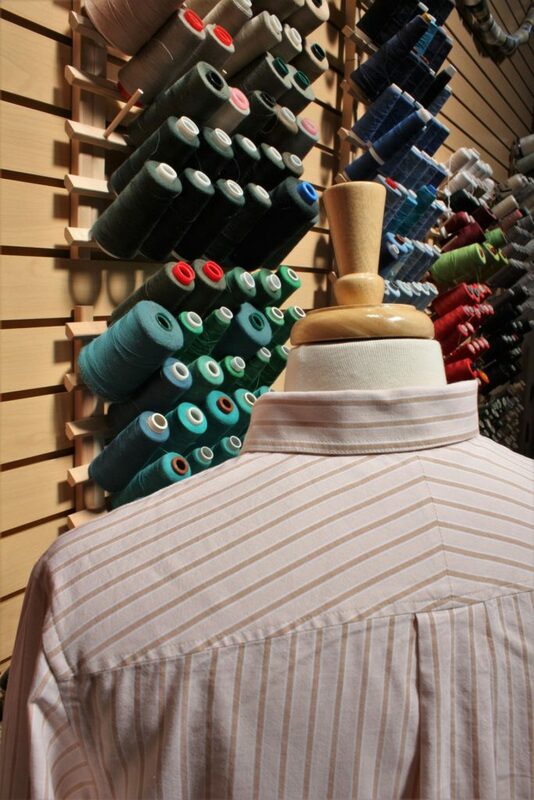 The thread wall is free with membership, along with notions such as buttons, zippers, interfacing, etc.. I used one of the studio dress forms. Sips N Sews has better lighting than my home, but even so I find photography challenging. 4) I’m glad you’re looking forward to the fitting series. I have the whole thing outlined, but writing it is still going to be a slog. I’m currently engaged in my final project for Draping class, but will try to get the first fitting installment out as as soon as I can. The detail and precision stitching make this a beautiful shirt. Great work and well written article. Thank you. I learn at least one thing (and usually many more things) each time I read one of your blog entries. Thanks for the taking the time to explain your process and for photographing it. (I think your photographs are fine!) Love the shirt and the blog. Keep it up! This looks brilliant, can I ask how do you finish the seams of the split yoke please? TUTORIAL–Chevron (Bias) Pockets and Yokes…The Easy Way! The trick is that you FIRST sew the bias seam with the raw fabric on the sewing machine. THEN you place the pattern piece on the fabric, centered on the bias seam, and cut your yoke pieces. Next, you construct the yoke as you normally would. I take the extra step of staystitching all edges of the yoke (inside the seam allowance), since everything is on bias at that point and I want to minimize stretching and distortion. Likewise, I try to be gentle handling the fabric as it goes through the machine.